If you feel increased stress, nervousness or anxiety when you think about visiting the dentist, then you’re probably dealing with dental anxiety. Avoiding a visit to the dentist due to these intense feelings can result in increased dental pain, a higher risk of gum disease, and tooth loss. Who Suffers With Dental Anxiety? The short answer: a lot of people. The American Association of Endodontists conducted a survey that showed that as many as 80% of adult Americans fear going to the dentist, and more than half indicated that this fear keeps them from going to the dentist for regular care. Women and children generally report a greater chance of fear and avoidance than men and the elderly. Invasive treatments, such as root canals or oral surgery, top the list of fears as opposed to less invasive procedures like dental cleanings and x-rays. No matter the reason, Dr. Nelson strives to provide the best dental care in a comfortable, relaxed atmosphere. From your very first visit, Dr. Nelson listens to your concerns and addresses any questions you might have, providing what you need to enjoy your dental visit. Those who struggle with dental anxiety experience more than increased risk for unnecessary dental pain or problems. Avoiding the dentist for regular exams and cleanings can lead to more severe dental problems that cost more money to correct in the long-run. These situations can also include emergency care, which can also cost more than consistent dental care. Emotional and health issues can accompany dental anxiety. The higher levels of stress experienced can lead to feelings of self-consciousness, depression, insecurity and low self-esteem. In addition, gum disease and tooth loss, which are experienced by those who struggle with dental anxiety, can lead to larger physical problems like heart disease, diabetes and stroke. 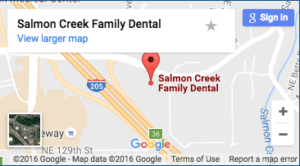 There are many ways to deal with Dental Anxiety, and Dr. Nelson and the compassionate staff at Salmon Creek Family Dental are more than willing to help. First, share your feelings and fears with us. There are many ways that we can adapt necessary treatment to meet your needs. Second, make and keep regular dental appointments. These will help you take the best care of your teeth without having to experience a great degree of discomfort and pain. Potential problem areas can be caught and treated early. Third, before these appointments, eat calming, high-protein foods, avoiding caffeine and sugar. Relax using deep-breathing techniques and take advantage of the amenities we offer to provide a distraction through your appointment. Oral Sedation – administered in pill form, this type of sedation allows you to remain conscious but feel relaxed and even sleepy during your treatment. Nitrous Oxide Sedation – nitrous oxide, also known as “laughing gas,” is inhaled through the nose, allowing you to relax but still respond consciously during treatment. Deep Sedation – Administered intravenously or through general anesthesia, this method of dental sedation is appropriate ideal for extremely phobic patients, those with significant medical conditions, and long and complex surgical dental procedures. Regardless of your level of anxiety, Dr. Nelson and his staff at Salmon Creek Family Dental will do whatever they can to make you as comfortable as possible during your dental treatment.